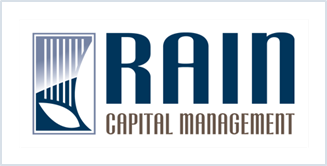 Rain Capital Management, LLC (“Rain”) is an SEC-registered investment adviser located in Portland, Oregon. Rain and its representatives are in compliance with the current registration and notice filing requirements imposed upon SEC registered investment advisers by those states in which Rain maintains clients. Rain may only conduct business in those states in which it is notice filed, or qualifies for an exemption or exclusion from notice filing requirements. Rain’s website is limited to the dissemination of general information regarding its investment advisory services to United States residents residing in states where providing such information is not prohibited by applicable law. Accordingly, the publication of Rain’s website on the Internet should not be construed by any consumer and/or prospective client as Rain’s solicitation to effect, or attempt to effect transactions in securities, or the rendering of personalized investment advice for compensation, over the Internet. Furthermore, information on this Internet site should not be construed, in any manner whatsoever, as the receipt of, or a substitute for, personalized individual advice from Rain. Any subsequent, direct communication by Rain with a prospective client shall be conducted by a representative that is either registered or qualifies for an exemption or exclusion from registration in the state where the prospective client resides. For information pertaining to the registration status of Rain, please contact the United States Securities and Exchange Commission on their website at www.adviserinfo.sec.gov. A copy of Rain’s current disclosure brochure discussing Rain’s business operations, services, and fees is available from Rain upon written request. Rain does not make any representations as to the accuracy, timeliness, suitability, completeness, or relevance of any information prepared by any unaffiliated third party, whether linked to Rain’s website or incorporated herein, and takes no responsibility therefore. All such information is provided solely for convenience purposes only and all users thereof should be guided accordingly. Rain Capital Management is committed to safeguarding the confidential information of its clients. We do collect nonpublic personal information in order to open and administer client accounts with us and to provide clients with accurate and pertinent advice. We hold all nonpublic personal information clients provide to us in the strictest confidence. If we were to change our firm policy, we would be prohibited under the law from doing so without advising clients first. We will get client permission first before we share personal information with most nonaffiliated third parties. However, this does not apply to sharing information with nonaffiliated third parties in connection with maintaining or servicing a client account, or administering transactions requested or authorized by clients. Clients may direct us not to make disclosures (other than disclosures required by law) regarding nonpublic personal information to our financial marketing partners. Clients also have the right to opt out of having their information shared with affiliates of Rain Capital Management LLC. If a client wishes to opt out of disclosures to third parties please contact us at (503) 822-1700. Information about client transactions with us or others. We do not sell client personal information to anyone. We will provide notice of changes in our information sharing practices. If, at any time in the future, it is necessary to disclose any of a client’s personal information in a way that is inconsistent with this policy, we will give that client advance notice of the proposed change so they will have the opportunity to opt out of such disclosure. For nonaffiliated third parties that require access to a client’s personal information, including financial service companies, consultants, and auditors, we also require strict confidentiality in our agreements with them and expect them to keep this information private. Federal and state regulators also may review firm records as permitted under law. We do not provide clients’ personally identifiable information to mailing list vendors or solicitors for any purpose. Personally identifiable information about clients will be maintained during the time one is a client, and for the required time thereafter that such records are required to be maintained by federal and state securities laws. After this required period of record retention, all such information will be destroyed.